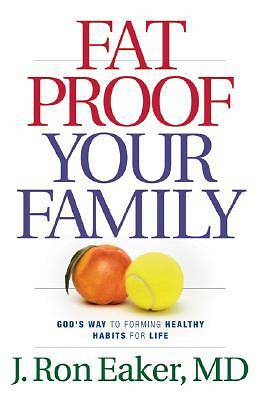 Improve Your Family?? 's Future Today Are you tired of losing weight that inevitably comes back? Are you concerned about your kids??? health and want to be a fit family? If so, this book is for you. The key to long-term success is to get the entire family involved in a healthy lifestyle. Not only does motivation jump when you realize the influence you have on your spouse and kids, but healthy habits are so much easier--and satisfying--when people you love enjoy them too. In Fat-Proof Your Family, Dr. Ron Eaker presents simple, practical, and livable ways to lose fat and achieve lasting health and wellness. Together you can: ??? Stop the cycle of family-related weight problems ??? Get fit with uncomplicated, age-specific goals and plans ??? Pursue physical and emotional and spiritual health ??? Enjoy variety rather than endure restrictions ??? Learn what really works, based on science not fad This isn?? ?t a pie-in-the-sky approach. And it?? 's not about quick fixes, secret formulas, or even diets (they don?? ?t work ). The ???Fat-Proof??? lifestyle is for normal, busy families like yours. It represents hope for a better life now and in the future. As a parent, it?? 's one of the best gifts you can give yourself and your children.